Up to now I have been enjoying House of Whispers, although at times I have found the story a bit complicated, to the point of being confusing. But there was obviously a lot of thought and effort put into the series, so I was determined to persevere with it. I am so glad that I did. With issue 7, the series has found its footing. 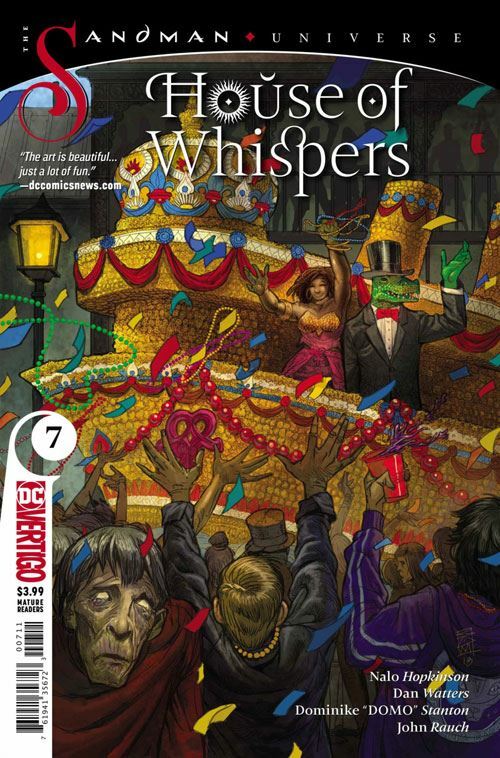 The House of Whispers has become a ship, with Mistress Erzulie at the helm. This issue, while still advancing the various subplots that have been developing, takes the time to tell some good old fashioned spooky stories along the way, using the ship as a framing sequence, much in the style of classic House of Mystery or Secrets. Stanton does a great job with this, art-wise, giving the stories a physical framing of tattered pages, while Rauch puts a sepia tone onto them, highlighting their separation from the main elements of the story. Of course, just telling a few spooky stories within a framework is nothing terribly exciting in and of itself. It needs some surprising tie-in to the main plot for it to really hit home. And that’s exactly what happens here, with an unexpected, and very welcome, guest star showing up to close out the issue, and build the suspense for the next one. I hesitate to use an overworked phrase, but this issue really would be a perfect jumping on point, a well executed tale that is bound to make one want to pick up the next issue.